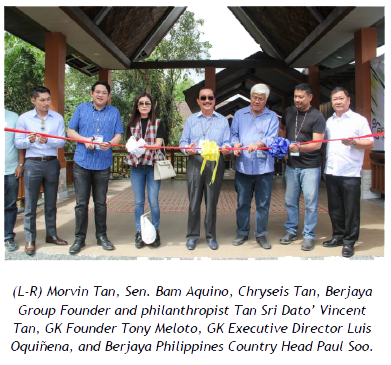 ‘Business of love’ Berjaya Group Founder and Malaysian philanthropist Tan Sri Dato Seri Vincent Tan leads unveiling of Berjaya Garden Restaurant and Culinary Center at GK Enchanted Farm – Berjaya Philippines Inc. The legacy of caring continues to sow hope and transformation, as various minds with a common cause unite in making an “inclusive” world a reality for all at the recent Social Business Summit 2017 by Gawad Kalinga (GK). Joining the concerted global action to end poverty through sustainable community-building is Berjaya Group Founder and Malaysian philanthropist Tan Sri Dato Seri Vincent Tan, who came back to the Philippines to fulfill yet another commitment to the noble GK cause. Tan Sri flew in the country to lead the unveiling of the Berjaya Garden Restaurant and Culinary Center (BGRCC), a training facility that supports the Gawad Kalinga Enchanted Farm’s dynamic role as an incubator-hub for the country’s growing social entrepreneurship. Located in the GK Enchanted Farm in Angat, Bulacan, the BGRCC is envisioned as one of the vital cornerstones of learning inside the farm — touted as the “first farm village university in Asia” — as it serves as the primary food center of the farm, catering to the 200,000 partners, entrepreneurs and students who visit the GK Enchanted Farm annually. The food served in the restaurant is locally produced, sourced and processed, providing livelihood for local farmers. BGRCC is also a school-within-community where students and social entrepreneurs can develop their culinary skills and products. Joining Tan Sri at the landmark opening are: GK Founder Tony Meloto, Berjaya Philippines Country Head Paul Soo, GK Executive Director, Luis Oquiñena, Sen. Bam Aquino, Berjaya Philippines Executive Director Tan Eng Hwa, GK Enchanted Farm COO Shanon Khadka, and Tan Sri’s children Morvin and Chryseis Tan. The milestone marked the Malaysian conglomerate’s steady support for the Gawad Kalinga mission. The Berjaya-GK collaboration started in 2012 when Tan Sri, through Berjaya Philippines Inc., pledged to contribute PhP300 million over three years to GK for the construction of houses for Filipinos affected by Typhoon Sendong and other natural calamities, as well as for poverty-stricken families across the Philippines. To date, Berjaya has successfully helped build 820 GK houses in 14 provinces. What began as a shared vision to help victims of calamity has now expanded to bigger dreams of building a sustainable template through initiatives such as the BGRCC that create life-changing impacts on the poor and needy. youth representatives, and GK volunteers have gathered to take part in the momentous event that brought out the best in every one. “It’s been joyful having you around, marking this milestone with friends who have come over to join us. The untapped wealth of this world is at the bottom, that so much human capital and potential is yet to be discovered. Let’s just keep this overflowing generosity spilling from all corners of the world,” he said. And there is indeed a great deal to celebrate. Tan Sri, in his speech, expressed his utmost elation over the continued success and growth of Gawad Kalinga communities in the different parts of the world. Formally established in 2003, GK has grown into a global movement of nation builders and is now present in various countries. “I’m very pleased and deeply honored to be given the opportunity to join GK’s vision of creating sustainable community development in the Philippines. GK’s work is very commendable; many countries need GK. But I have to ask GK people to build communities faster; if they do, we would like to commit building 5,000 homes, from the original 3,000 units that were first committed. This is just to emphasize my admiration and support for GK. Truly, every one of us, rich or poor, can make a difference in their own ways. People should go out and help each other in reaching a common goal,” Tan Sri said. Tan Sri’s heart for humanitarian causes is emboldened in his personal foundation, the Better Malaysia Foundation. It supports various community and charitable causes which include educational programs, medical and health causes and humanitarian aid. Besides providing financial aid to health related causes such as treatment of diseases like kidney ailments, cancer and AIDS, TSVT has also set up a free acupuncture center serving the underprivileged community and funded three hemodialysis centers to subsidize poor kidney patients. For the Group, Berjaya Cares Foundation was set up to create a more synergistic effort in the corporate social responsibility initiatives of the various subsidiaries within the Berjaya Corporation group of companies. Among the Foundation’s core focus areas are supporting educational programs and initiatives for underprivileged children and youth, outreach programs for poor communities, providing aid to health-related causes, conserving and protecting the environment, supporting Malaysian performing arts and culture, animal related causes, promoting staff well-being and providing humanitarian aid locally and internationally. In a press conference, Oquiñena lauded Berjaya Group for its immense contribution in helping create impacts on the far-flung areas in the country. “The beauty about the partnership between our chairman and Tan Sri is that it builds friendship between two peoples and two nations. Berjaya has been paving the way for the most difficult to reach areas like down Muslim Mindanao and Eastern Samar, where most corporations don’t want to go simply because there’s much media going here. Berjaya is not about building its own brand, it is bent on building a legacy of caring. The friendship and trust between GK and Berjaya, the Philippines and Malaysia, have made all these happen,” he said. In terms of spearheading projects that help the locals, Soo revealed that one of Berjaya Group’s philanthropy highlights is its vital support for GK’s (SEED) scholars. The Group has already sponsored a total of 42 Filipino indigent students, with full tuition and board, to the Berjaya University of Culinary Hospitality, an institution in Kuala Lumpur specializing in culinary arts, hospitality and tourism education. “The corporation itself does not stop in just giving out cash donation. Our employees from across the group actually go and visit the GK sites and volunteer their time for the home-building. I think that an important thrust that we do, we ensure that the people who work at Berjaya Group are aware of the CSR works that we do for the communities and people in need,” added Soo. Tan Sri also met with three SEED scholars – Danilo Ablen, Johnson Acdang, and Vincent Tatel – formerly unschooled children of farmers. Deeply impressed by the students’ accomplishments and determination, Tan Sri Vincent Tan leveraged again on quality education as being one of the most powerful weapons to combat poverty. “It is so inspiring to hear their stories. Indeed, the poor can triumph greatly in life. I’m so happy that we can help people like them, and we still want to continue helping more, providing them opportunities to dream more. GK can do lots more, it is to me a most admirable organization. We have great faith in them. If we can fulfill our pledge of building 5,000 homes, I’ll be very, very happy. Working together with GK, I believe we have done more than our fair share in the Philippines,” concluded Tan Sri. Berjaya has been in business in the Philippines for 24 years, holding majority control in several business outfits such as Philippine Gaming Management Corporation, Papa John’s Pizza, Load Central, Berjaya Makati Hotel, as well as the distributorship of Mazda and Ssangyong vehicles. Berjaya pledges to continue to invest in the Philippines both financially and in human resource, as well as support the community in times of need.